Description: An on going installation honouring the complexities and mysteries of Qiqayt history, Canadian colonialism, and the artist’s own personal journey. 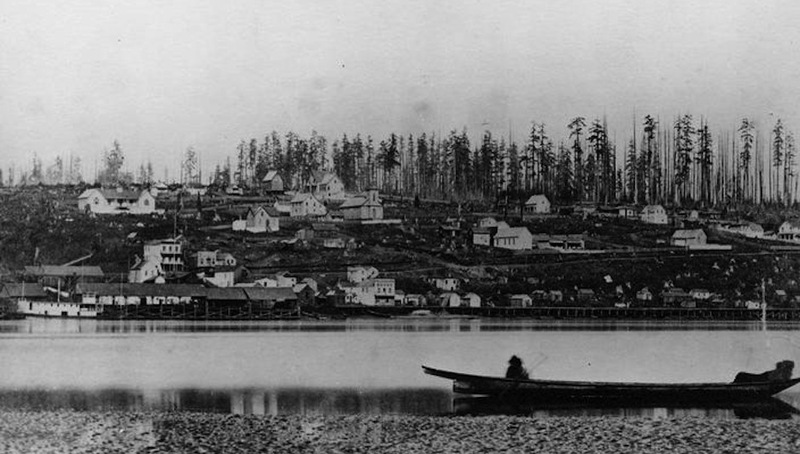 Emilio Portal was born 1982 in New Westminster, British Columbia, the traditional territory of the Qiqayt nation. Bio: Emilio Portal is an artist, musician, builder, and designer of French and Peruvian descent. 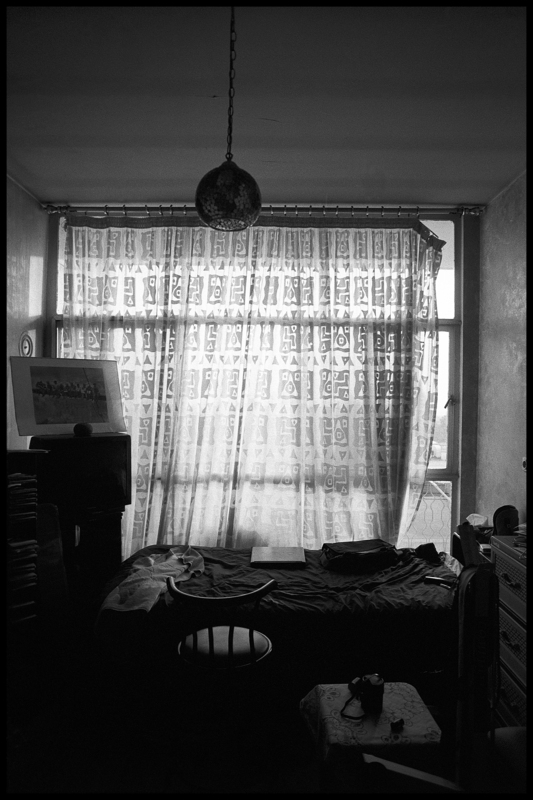 Portal’s work is inherently interdisciplinary and spontaneous – preferring to work in-the-moment, rather than through script. Portal has spent a number of years with Dakota, Nahuatl, and Wixarika elders experiencing the immeasurable wisdom of traditional knowledge. He received a BFA from Laurentian University in 2005, a Bachelor of Environmental Design from Dalhousie in 2007, and graduated from the MFA program at the University of Victoria in 2011. Ali Ahadi is a Vancouver based photo and video artist. He received his BFA from the Azad University of Central Tehran, 2007 and is currently attending the MFA program at the University of British Columbia. Location: On Main, 1965 Main St.
On Main (1965 Main St.) and grunt gallery are partnering to present a group exhibition of artists responding to two works from grunt’s archive by Ahasiw Maskegeon-Iskew “Speaking the Language of Spiders”, a net art project from 1997 and “White Shame” a performance from 1992. 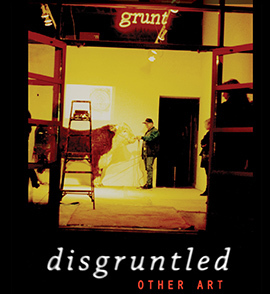 This project is another way that grunt is Activating the Archive, and complements the recently released curated website of Ahasiw’s work at ghostkeeper.gruntarchives.org. In response to “Speaking the Language of Spiders”, Cheryl L’hirondelle has created an audio work, and Archer Pechawis in collaboration with Sheila Urbanoski have created a website. Adrian Stimson and Elwood Jimmy will be performing works in reference to “White Shame”. In addition to these newly created pieces, the original works by Ahasiw will be presented as part of the exhibition, including a fresh edit of “white Shame”. Among the first aboriginal artists in Canada working in New Media and Net Art, Ahasiw Maskegon-Iskwew’s work as a curator, producer and writer laid important groundwork for Aboriginal artists in these fields, his is an important voice in the development of these media within the aboriginal communities. This exhibition will be launched with a series of performances, artist talks, and panels starting at 1pm at 1965 Main St. the opening day of the exhibition. H2O Cycle is a series of three videos shot in and around English Bay in Vancouver, BC. These videos were presented in grunt’s Media Lab as a loop for the duration of the exhibition. 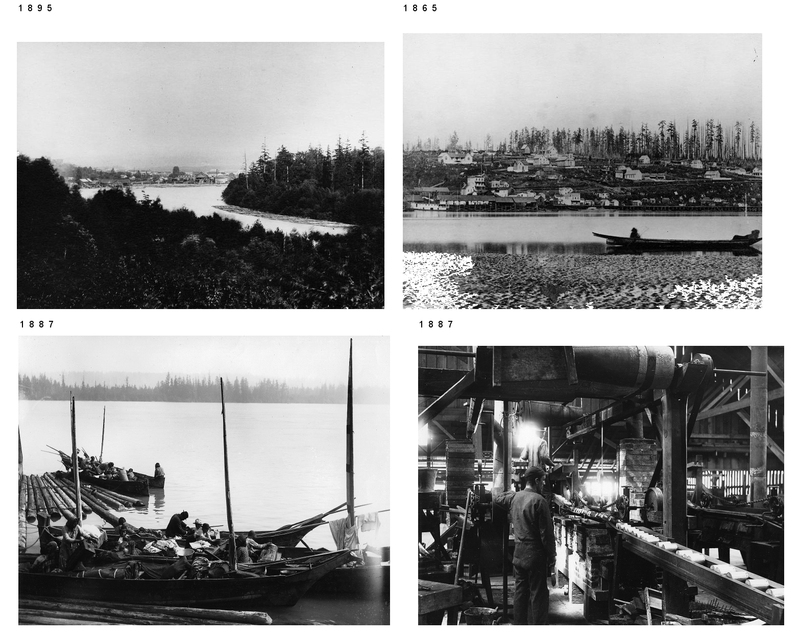 The three videos are characterized by their relationship to water; what Roux describes as “a way of working.” Water in its various forms and resonant meanings shapes the nature of these videos. This can be understood in contrast to another group of his videos, RGB Cycle, where colour rather than water form the basis of his working methodology. Roux’s process can be characterized by a constant back and forth between complexity and simplicity, experiment and analysis. Gradually, his work finds its place between what he has in mind and what he encounters while wandering through the landscape. This exhibition was produced in conjunction with CSA Gallery. Born and raised in a small French town, François Roux is a 24-year-old artist. Having completed an internship at the grunt gallery, he currently works with Vancouver artists Geoffrey Farmer, Kevin Schmidt, and Hank Bull. 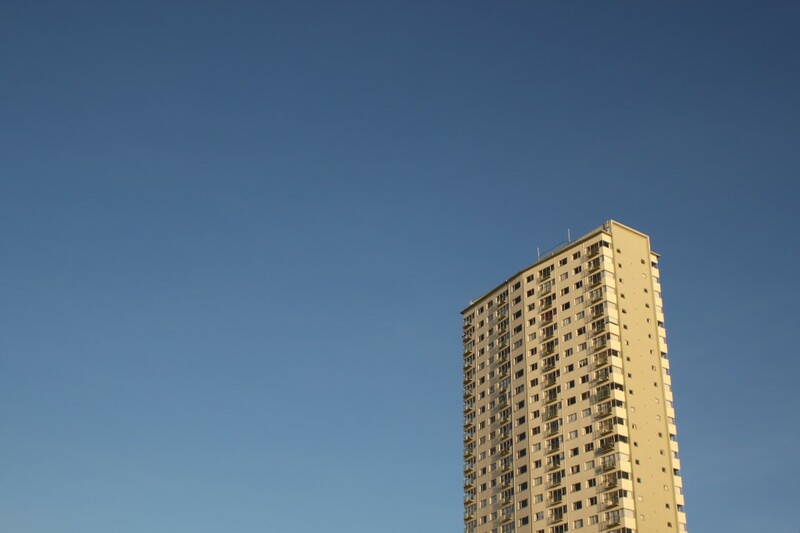 Until the age of 18, François came to know the urban landscape on his skateboard, alternately via skate spot reconnaissance and drunken wandering. Carvings in wood, grasses wrapped in fabric and hair, and a clan of turtles become signals and searchers to remember those lost or missing. Grunt gallery is pleased to present the work of Charlene Vickers in her new installation entitled, “Ominjimendaan/ to remember”. This exhibition is comprised of a range of sculptural objects including wrapped grasses, sturdy spear forms, and stylized turtles. At the heart of this exhibition, Vickers evokes a healing space for those who have experienced loss or who are looking for someone who is missing. Within each grass stalk, spear, and turtle, memory is a source of experiential meaning both historical and personal, for maker and viewer. History, healing and growth are themes of the early wrapped grass and fabric works. 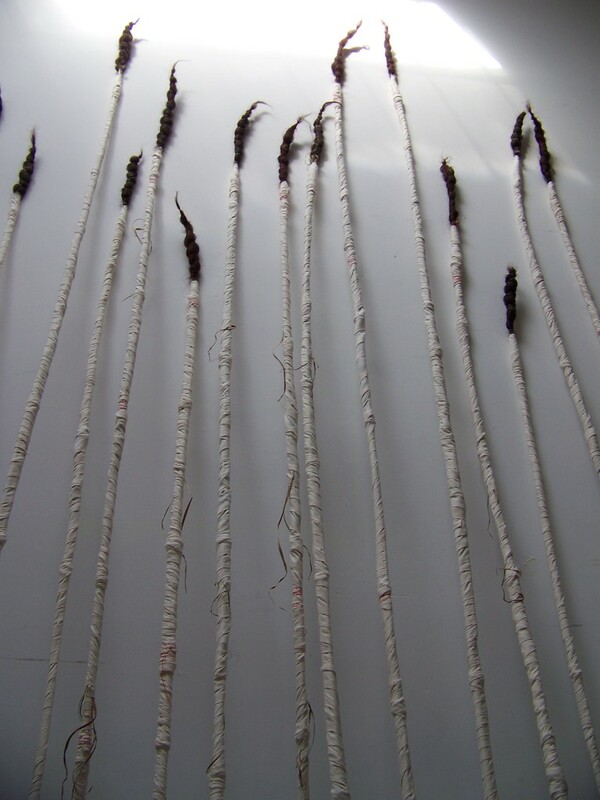 By wrapping and binding grasses and hair together with cotton and linen strips, the grasses begin to resemble bone-like forms to evoke vulnerability and recovery. The most recent wrapped grasses stand facing the viewer in relation to their own body. Emphasis on how the body and experiences of the viewer are incorporated in the meaning of the work is crucial. Tall lengths of pointed, sharpened cedar stand balanced against a wall waiting for someone to employ them with purpose; a story, a history, an action. Resembling spears or tipi poles, one thinks of weaponry, hunting, or traditional shelters that provide protection and sustenance. The initial idea for the form of the work began when thinking of the porcupine quill and its elegant and efficient functionality as deterrent to predators. The clan of turtles are the searchers of things lost: people, culture, languages, and histories. The clan shuffles, floats, dreams and searches to find lost sisters and family members, then slowly re-enters the land and the rivers from where they came. This exhibition was produced in cooperation with Urban Shaman Gallery, Winnipeg. Charlene Vickers is an Anishinabe artist based in Vancouver BC. She graduated from the Emily Carr Institute of Art and Design (94) and is currently an MFA candidate at Simon Fraser University (2013). Born in Kenora Ontario and raised in Toronto her art explores her Ojibway ancestry and her experiences living and working in urban spaces. Vestige Vagabond, a performance and collaboration with Maria Hupfield was recently presented at the 2011 Santa Fe Indian Art Market hosted by the Museum of Contemporary Native Arts. Grunt gallery is pleased to present Christoph Runné’s 16mm film installation entitled “Baum”. 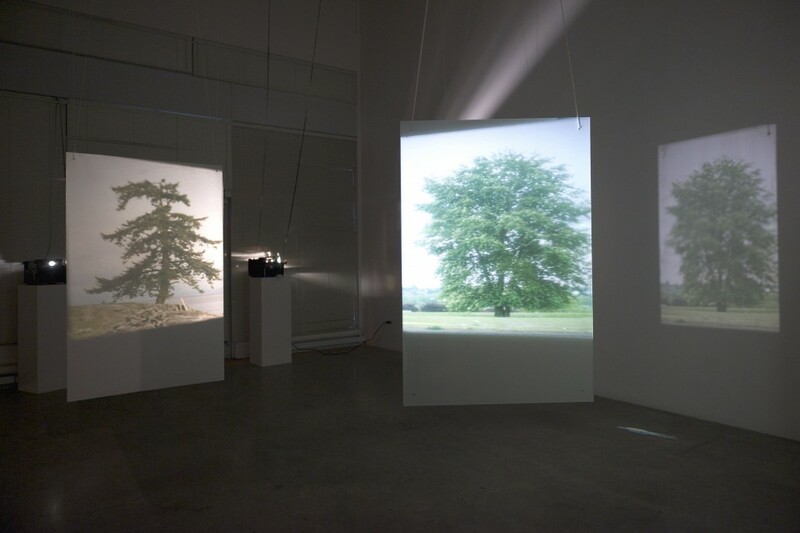 “Baum” uses multiple 16mm film projections to create a sparse and virtual forest that is traversed by a solitary figure that appears both rooted and moving throughout the frames. The cyclical and repetitive movement of the abstract wanderer suggests a passage of time, and a path through the subconscious as the drifter searches for his or her place. An attempt to give form to intangible abstractions, such as “longing” or “isolation,” is evident in the discontinuous flickering of the trees caused by the single-frame footage shot of a motion picture camera—a staccato movement suggestive of Morse-code communication or the arrhythmic pressing of typewriter keys. Through this work, Runné explores the visual symbolism of the tree. While the human condition often seems caught in cycles of hopelessness, homelessness, poverty, and “uprooted-ness”, caused by socio-economic strife, wars, and refugeeism, despite great wealth, education, and promise which should be able to allay suffering— Trees, in contrast, stand vigil; firmly rooted— steadfast reminders of survival, regeneration, and hope within natures’ grander cycles. Man’s reflection on his place in nature is timeless, and the poetic metaphors which trees inspire are as relevant in a contemporary context as they were in antiquity. 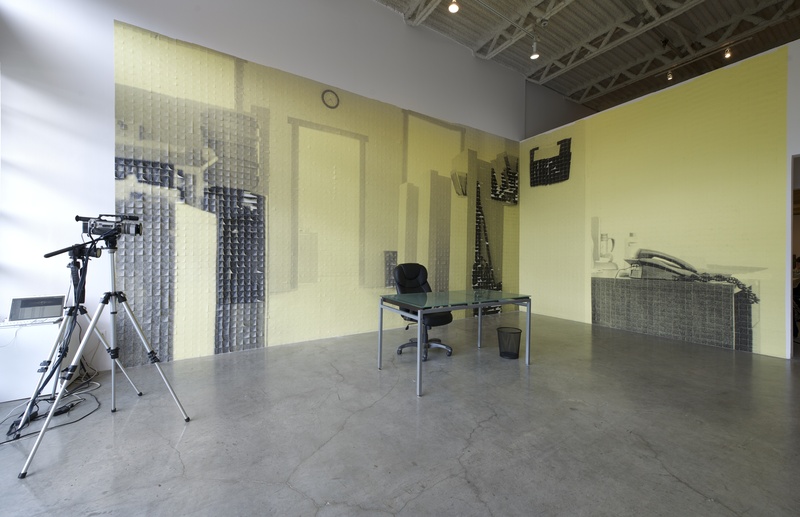 Christoph Runné is a Vancouver-based experimental film, video, and installation artist. His work explores the unhidden yet seemingly invisible world around us. He creates visual tone poems with a humanitarian heartbeat whose minimalist and impressionistic methodology contradicts the complex human conditions with which Runné engages. grunt gallery is pleased to present video and digital stills of works by noted Newfoundland-based artist Colette Urban. The exhibition Pin-up will feature digital stills from the new performance “Limited Possession”, digital stills from HOOT and a single channel video loop documenting HOOT’s performance as an introduction to the film Pretend Not To See Me. “Limited Possession” will premier at grunt on October 28th. 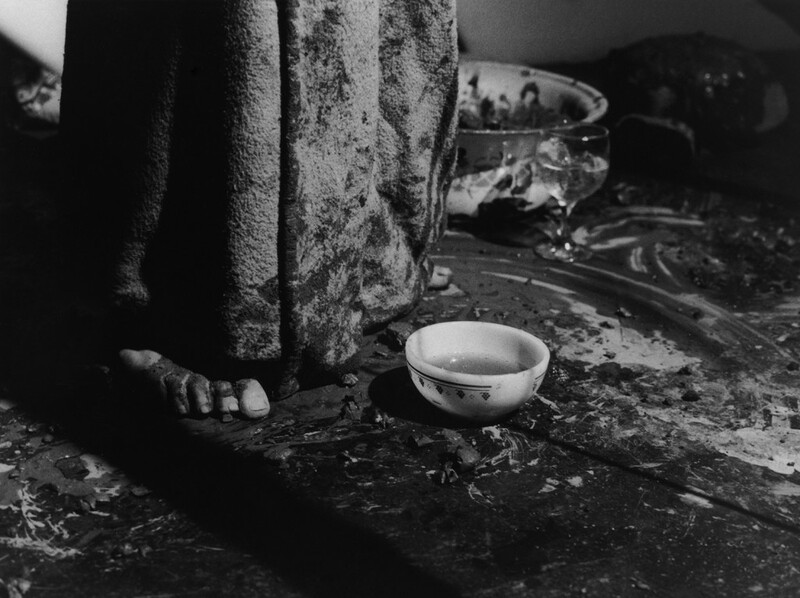 “Limited Possession” is a performance-based project that was documented for an exhibition of thirteen still photographs. The documentation took place in a storage facility in the community of McIvers, Newfoundland. This project includes the production of a 2012, signed-edition calendar. The gallery installation will also include a slightly larger than life-size photographic, sculptural cut-out of the performer. HOOT is a performance that was documented at Full Tilt Creative Centre for the purposes of the installation. The costume is made up of a feathered garment, petticoat and a helmet with CD discs and battery lights. Performance artist Colette Urban uses humour to address themes of identity and social convention. Born in Denver, Colorado, she immigrated to Canada in 1973 where she studied and established her career. She began spending summers in Newfoundland in 1993. In 2007 she moved full-time to Newfoundland and established the Full Tilt Creative Centre on an abandoned chicken farm. grunt gallery is pleased to present Rebecca Chaperon’s latest suite of paintings, entitled Like a Great Black Fire. In this series, an elongated and detailed landscape stretches across canvases populated by foreboding, black, geometric forms and meticulously rendered figures. 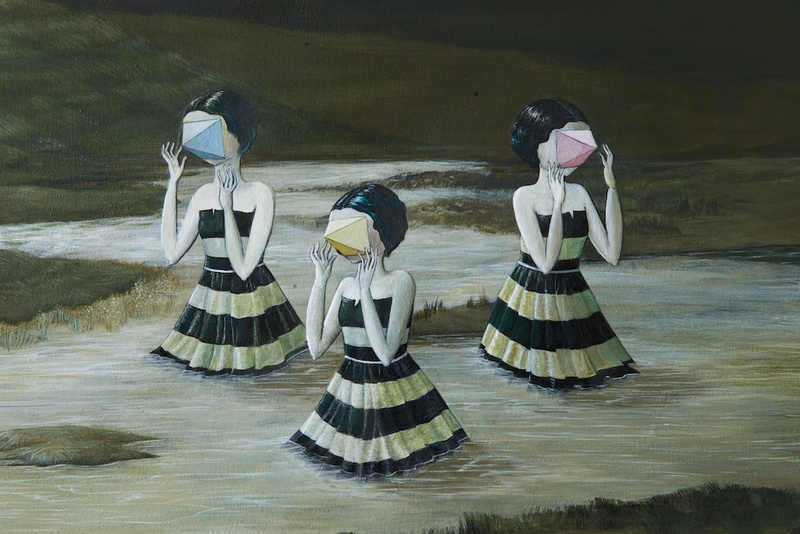 Her current paintings portray the narrative of a female protagonist within a surreal landscape. Chaperon’s subject matter ranges from ethereal and dream-like to darkly humorous; she often deals with the feminine perspective from an autobiographical point of view. With a compulsion to create unique visual stories, Rebecca Chaperon takes the imaginative subjects of her paintings and establishes an ability to engage people by speaking to the enchantment of our human experience. Her paintings act as a means of storytelling, conveying the notion of human struggle in the 21st century. Tempered by references to the synthesized, modern world she combines the classical landscape aesthetics of the past with an aspect of ambient, self-reflective self-portraiture. Born in England in 1978, Rebecca settled in Toronto, Ontario at age 8. She attended Emily Carr University where she studied fine arts until graduation in 2002. She has exhibited her work across Canada and has been featured in several Canadian publications. “It’s her laborious attention to detail that draws you in, like that dream you keep trying to fall asleep to catch another glimpse of. You can’t help but be drawn into her invitingly playful painting technique which quietly screams off the canvas. Immony Men is a Canadian visual artist currently based in Montreal and Toronto. He is a recent graduate of the MFA Visual Arts program at University of Windsor. He has completed Concordia’s BFA program majoring in Interdisciplinary Studies within Studio Arts. Immony is a member of the Broken City Lab research group; an initiative that tactically disrupts and engages the city of Windsor. Skullduggery is a painting installation rooted in palio-archaeology and physical anthropology. 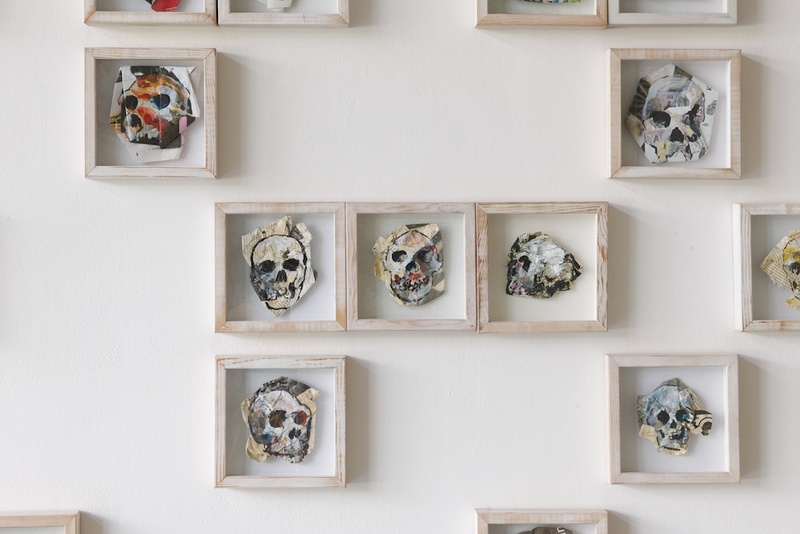 The works consist of an installation of many small paintings of skulls taken from the human fossil record painted on wadded pages of art magazines. The skulls trace the range of human evolution, and the magazine pages, a record of art practices. Together they express the fragility of ourselves as a species and the punctuality of art movements. The installation presents a periodic story of our species painted on periodicals.